With technology development in the automotive industry, the complexity of the vehicle is increased, and hence the maintenance of the vehicle itself. In order for the independent aftermarket to remain competitive with the knowledge and services towards the customers in relation to the authorized service network, continuous training of mechanics becomes the key to success. CIAK Auto recognizes the importance of this segment of support for your business, and for several years we have been educating our partners with suppliers such as TMD Friction, Valeo, Bilstein Group, ZF Friedrichshafen and others. Over 140 training sessions in more than 30 locations in Croatia have brought the latest technology from our suppliers to you – our partners. By looking at the interest in deeper knowledge, we decided to take a step further – launch the CIAK Auto Academy. The CIAK Auto Academy is the name for a unified set of lectures focused on the professional training of mechanics and Mechatronics technician , where both theoretical and practical part of teaching takes place in locations throughout Croatia in order to bring knowledge closer to you as much as possible. With the support of Eure! 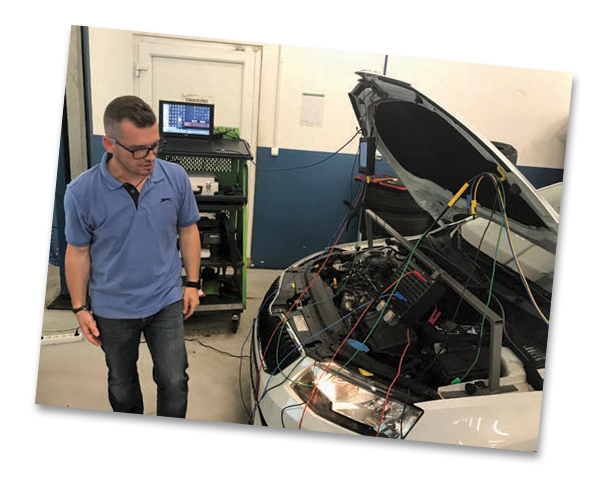 Car Organization, part of the AD International Group whose CIAK Auto is a member, we have prepared a demo vehicle that we will use to provide a practical overview of the topics that our technical trainers will handle. It is a vehicle from the VAG group, the Škoda Octavia III, 1.6 TDI CR, 105KS from 2015.